I am proud to list the following Rosary Makers. They have been a great support to me in my work. Rosary makers should support one another as we are all working for the same purpose of glorifying God with our work. At the same time we should respect the unique designs of other rosary makers and seek to develop are own style when making designer pieces. May the Blessed Mother and the Holy Spirit Guide us in our work! Sarah has been a good friend for several years. Her amazing rosaries are unlike any other. She hand makes each and every clay bead on all her rosaries, chaplets, bracelets, and necklaces. The artisan quality that characterizes her work, will leave you in awe when you hold your first Clay Rosary. A fellow rosary making friend, Stella is especially skilled in the art of wire-wrapping rosaries. She specializes in custom chaplets in honor of Saints, Our Lord, and Our Lady. They are beautifully made and heirloom pieces. I highly recommend Stella's work. Christine has been a real support to me and other rosary makers. She ran our Guild for some time as well as a Rosary Guild Blog. Her rosaries, chaplets, and prayer beads are gorgeous, artistically designed, and individually handcrafted in her studio with quality components. STORE is CURRENTLY on Maternity Leave. Bridget started making rosaries as a way to generously support Mary' Shelter, homes for unwed mothers. She is a generous and kind person. A great encouragement to me and talented artist. Laura has such a refreshing style reflected in her unique handmade rosaries, prayer beads, jewelry and her lovely website. Another website that's fun to visit for the sake of beauty alone. Such beautiful work! Morning Star Rosaries - Located in Canada! I got to know Josie a few years ago through the Etsy community. Josie is not only a lovely person. Her goodness shines forth in her work. She makes many beautiful handmade rosaries, rosary bracelets, pocket rosaries, tenners & chaplets. She also offers wire wrapped, and custom rosaries. I recommend Josie's shop especially to Canadian customers. 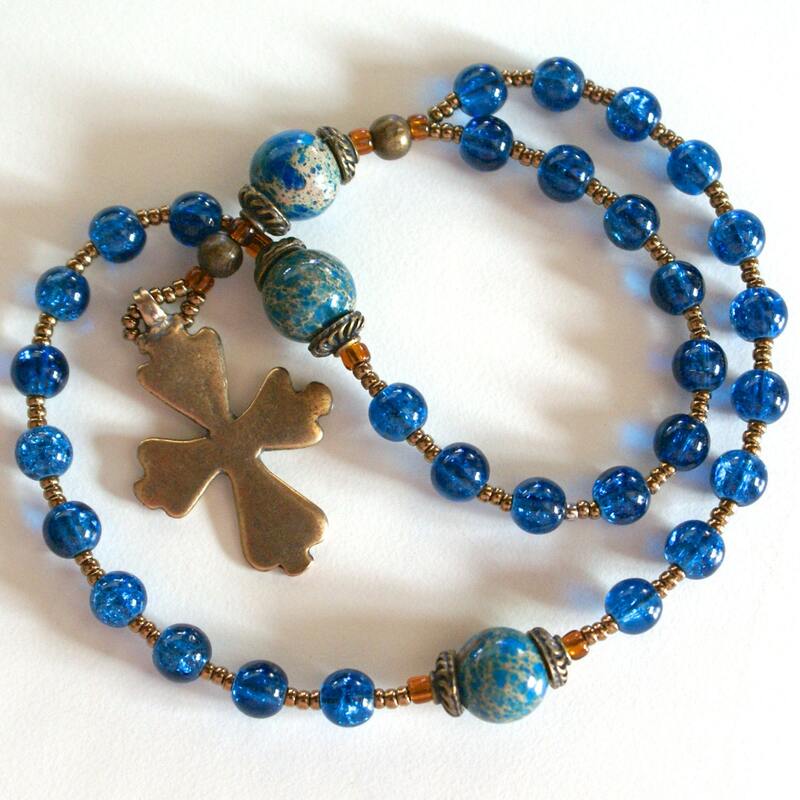 Linda is another wonderful lady that is a leader among rosary makers in the Etsy community. Linda makes gorgeous handmade rosaries, chaplets and prayer beads designed to enhance and deepen your rosary prayer. Jeanine offers custom and one of a kind Rosaries--each Rosary is handmade, and each bead is wire-wrapped in a swirl of Sterling or Bronze for beauty and durability. Jeanine's work is truly lovely! Robert has incredible workmanship in his rosary wire wrapping. Custom design work is a specialty. If you have an idea for a special chaplet or rosary he can make that happen. Sacramentals make wonderful gifts. Robert's rosaries are truly stunning. Annie has the most amazing rosaries. So many lovely stones and variety. Stunning craftsmanship. Her website is a feast for the eyes! She also has many great informational pages for those who need information about rosary making. Buy handmade rosaries, religious jewelry and many other religious products. Say iCare with a gift made of prayer! "OurCatholicFamilyLife.com is a mom blog that chronicles the goings-on of the Goddard Family, while celebrating the simple joys in life that unite us all as people. It’s a blog about faith, hope, love, and creativity. Stop by and say hello!" Gary makes the most beautiful hand painted Saint dolls. Each Wooden doll is a highly detailed, quality work of art. The likeness to modern day Saints are especially stunning. This is a great resource for rosary makers. They have a variety of beautiful brass rosary parts, as well as silver toned medals. I particularly enjoy the brass for its detail and shine. They also carry beads and findings. Definitely worth a visit. Winner of nine website awards offers entire line of Creed handcrafted rosaries (customizable! ), patron saint medals, religious art, jewelry gifts, baby items, and more! Rhonda is a sweet person that I met through the Catholic Etsy Artists Guild. She makes lovely Chapel veils, Catholic t-shirts and totes, saint dolls and other handmade Catholic goods. The Grace and Mercy Medal is an original design inspired from a devotion to Our Lady of Fatima and the Rosary.